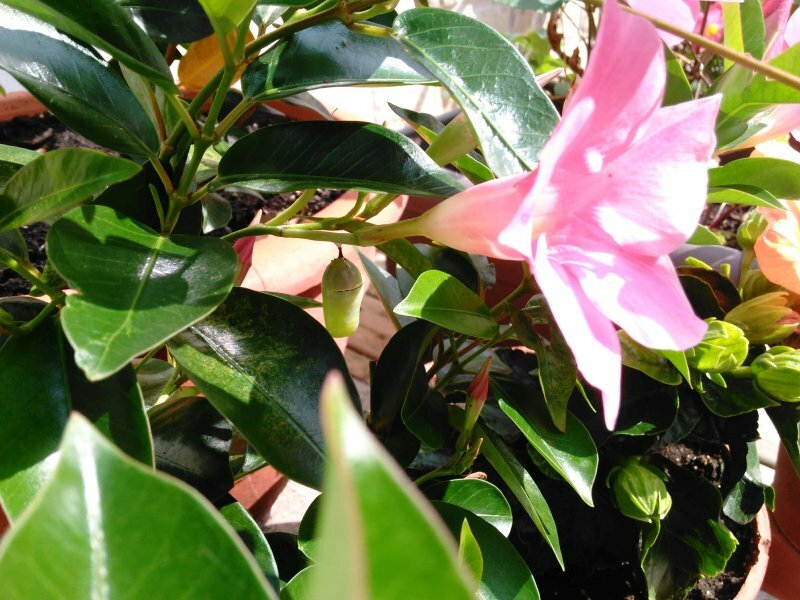 We have a large patch of land on our property that we have left naturalized – to provide a place for animals and especially butterflies and pollinators to live. Over the years the natural plants (weeds as some would call them) have really taken over and now grow three to six feet tall in most of the area. The animals thrive in this environment. On any given day we are not surprised, although quite delighted to see a variety of animals and insects including deer, rabbit, wild turkeys, fox, birds, butterflies, bumblebees and, of course, our house cats lording over them all. One thing we have been trying to encourage is the growth of milkweed for monarch butterflies and other butterfly friendly shrubs and plants. The milkweed will self seed once established and is starting to become so prolific that we are having to pull some from our gardens. 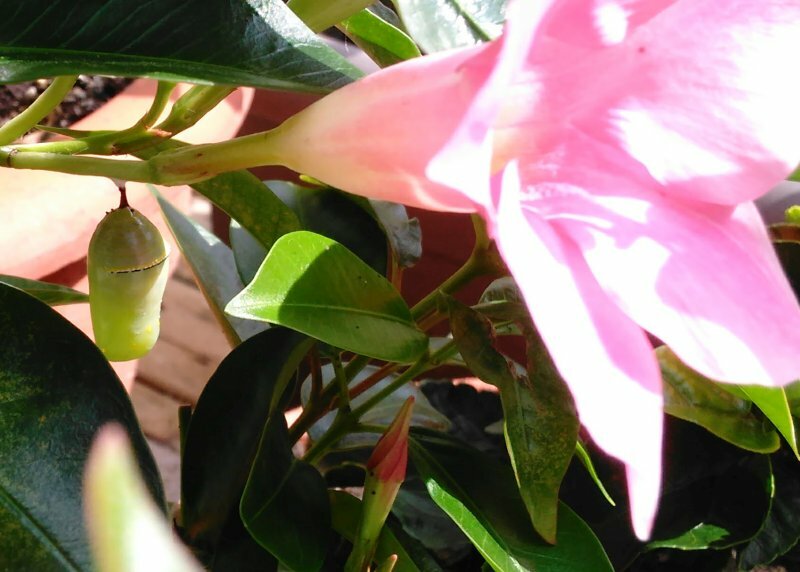 Monarch chrysalis hanging from a mandevilla plant. This year, our ‘butterfly garden’ had a great many milkweed plants and we have been especially lucky in seeing the monarchs making our backyard their home and nesting place. We have been fortunate enough to find many monarch caterpillars which are now creating their chrysalis throughout our property. 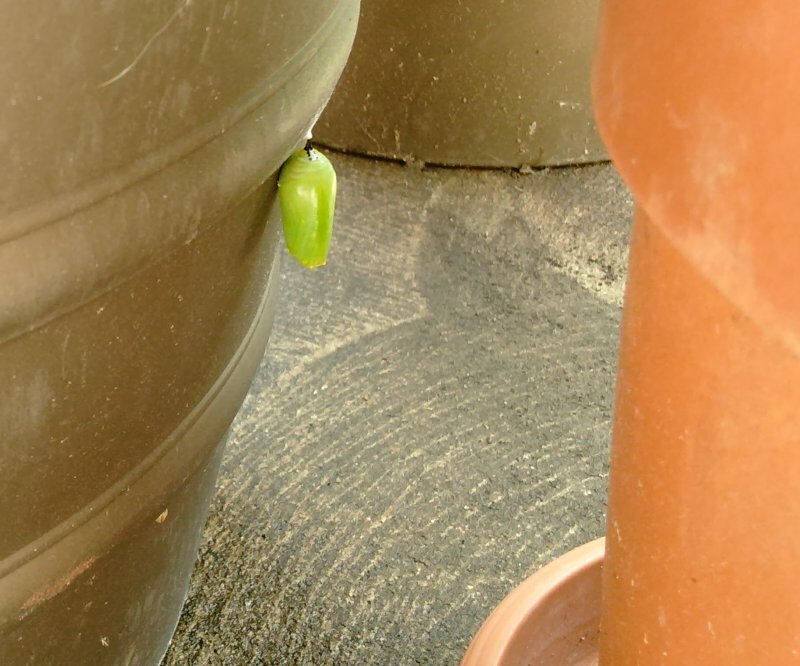 We can only assume that if they are spreading out enough to end up in the chrysalis stage among our garden flowers and potted plants that there will be a great many unseen within the naturalized area of our property. Hopefully, we will be around in a week or so to see the new monarchs emerge and begin their long journey southward. If you can, I’d encourage everyone to plant and protect a few milkweed plants on your property. As the only thing the monarch caterpillars eat, it is necessary for their survival as a species. 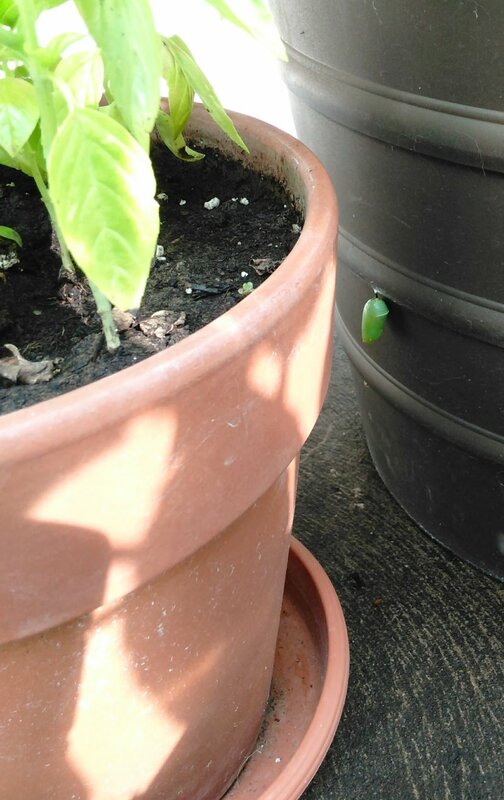 Monarch chrysalis hanging from the sides of pots on our porch.